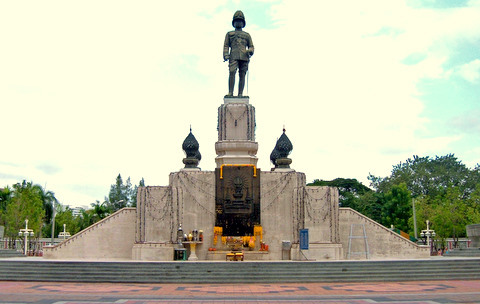 The King Rama VI Monument stands at the gate to the Lumpini Park, overlooking the busy Saladaeng junction. Corrado Feroci, an Italian sculptor completed the monument with the help of four Thai artists on 7 June 1941 and it was inaugurated on 27 Mar 1942. It was fitting that Feroci designed this monument, as it was King Rama VI who requested the Italian government for an artist to help teach and promote art in Thailand. Feroci answered the call of duty in 1923. 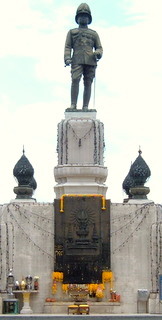 The monument is a statute of King Vajiravudh standing in his ceremonial uniform with a sword, on a high pedestal flanked by fountains. An open tiled area where public ceremonies are held surrounds the monument. A fountain in the foreground, neatly manicured lawns and beautiful flowerbeds at the four corners of the open area complete the setting. Offerings of garlands and joss sticks at the foot of the monument are evidence of the reverence paid by many to the monarch. 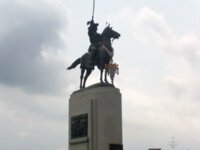 It is significant that this monument is located at the gates of Lumpini Park. 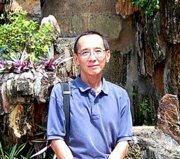 In 1925, King Rama VI decided to donate a huge plot of land called Saladaeng for use as a public park and exhibition area. 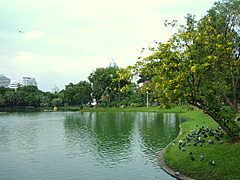 The park was named Lumpini Park after Lumbini in Nepal, the birthplace of Buddha. Beautified with plants from all over Thailand, the scenic atmosphere in the park is a pleasant respite from the hustle and bustle of the city. King Rama VI will also be remembered as the king who changed the Thai flag from a white elephant against a red background to the present tricolour representing the national trinity; white for religion, blue for the monarchy and red for the blood of the people. The new flag was first flown by the Thai Expeditionary Force to Europe in 1918 during World War I. The King Rama VI Monument was built with funds raised by alumni of the Vajiravudh College and the government as a tribute to King Vajiravudh and his legacy to the residents and visitors to Bangkok. The monument is located outside Lumphini Park by the busy Saladaeng junction which is served by the Saladaeng and Silom stations. As the roads in the area are extremely congested, it’s easier to get there by the Bangkok skytrain or Bangkok subway. The nearest skytrain station is the S2 Saladaeng station 300 m away in Silom Road. If you are going by subway, there’s an exit from the Silom (SIL) station just behind the monument. Just follow the signs to the park when you get off the subway. The monument is open to the public for 24 hours. 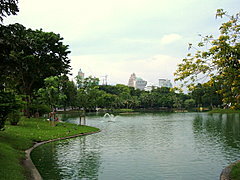 Lumphini Park is opened between 6:00 am – 8:00 pm. Admission is free.